For finding the prime numbers we write all the whole numbers from 1 to 100 in a 10-square table and then follow the following steps. Step 1: 1 is a unique number, so we do not consider it. Step 2: We cross out all the multiples of 2 except 2. Step 3: We cross out all the multiples of 3 except 3. Step 4: We cross out all the multiples of 5 except 5. Step 5: We cross out all the multiples of 7 except 7. 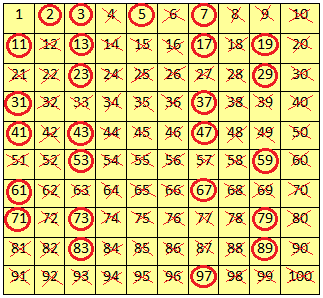 Step 6: Now, we encircle all the remaining numbers except 1. All the numbers encircle are prime numbers. Those which are crossed out are the composite numbers. 1 is a unique number. We see that 25 numbers are prime numbers out of the first 100 numbers.